Errands were ticked off the "to-do" list. Jake was done with his nap. Skype call with my brother in Toronto was made. Appointment was completed. Elder sons were dropped off to meet up with friends. What's next? The sun was up after a drizzle and it was still 3pm. 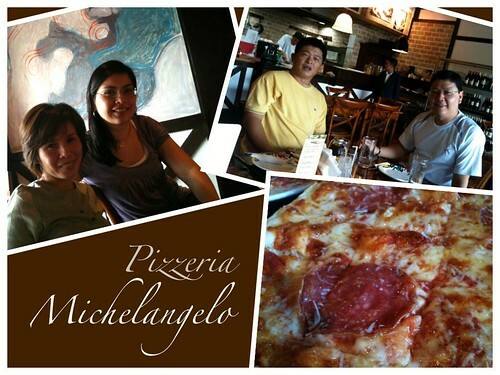 We had plenty of time to spare so we met up with good friends, Forden and Dahlia, and drove to Pizzeria Michelangelo to sample their pizza. Another good friend (hello Monica!) recommended this place and piqued my curiosity. And since I'd choose any cuisine over Chinese if I could help it, and the hubby would readily give in to my wiles, we were there in a few minutes. The place was quaint and the menu quite extensive and reasonably priced. Needless to say, we had one of the best tasting pizza. If it weren't for the liquor ban due to the "barangay" elections, the small party would have sampled their wine as well. Now that's another reason to visit again.